Buying and selling real estate is one of life's most important decisions, and is often a time of stress and excitement. It's the ending of one chapter and beginning of another. Having an ethical real estate agent who puts your interests before his or her own is essential. Christopher sees his role as that of a facilitator of transactions, and an advocate for his clients' needs. "My number one goal is to make sure that you are well represented, consulted and informed throughout the process. I will try to make your purchase or sale as smooth and easy as possible, providing relevant and timely information so you feel fully comfortable moving forward. My work is my signature, and my loyalty to my customers knows no bounds." One of the most powerful techniques Christopher finds useful in educating his clients about the real estate market is the "Conference Call Strategy. He wants to understand your desires and objectives, and create a strategic plan to achieve them. Because he values communication, Christopher always keeps his clients well informed and is highly responsive to their calls, texts and emails. He treats them as he expects to be treated, with respect, courtesy and dedication. Christopher comes from a real estate background with plenty of family and friends in the business. After many years in the retail and customer service, he too gravitated to the industry, first in property management/short-term rentals, then as a residential sales and rental agent. Being raised on Fisher Island Drive in Miami fueled his passion for the high-end luxury market. Thanks to his Brazilian and Portuguese heritage, Christopher speaks English, Spanish and Portuguese fluently. He attended Barry University in Miami and studied Sports Management, with a minor in Business. 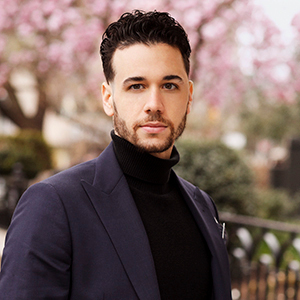 Let him put his knowledge and connections to work for you to help you navigate the bustling, fast-paced New York City real estate market!